An online safeguarding training course specifically nannies and au pairs. The course covers essential topics such as legislation, online safety, anti-radicalisation, indicators of abuse and neglect, and how to report concerns. recommend it. The staff at the Child Protection Company were very helpful when I encountered a problem of my making. On the whole it was a very good course. Excellent course, very informative with option to read/study more in-depth information at own leisure. Very useful downloads too. Covers everything from concern to referral, written in the context of caring for a child in their own home. I am a lone worker. Is this course suitable for me? Yes, the course contains detailed modules on recognising signs of abuse and neglect and reporting concerns. It addresses the unique issues that arise from being a lone worker. What do I need to do about other aspects of safeguarding and child protection training, such as online safety and the Prevent duty? 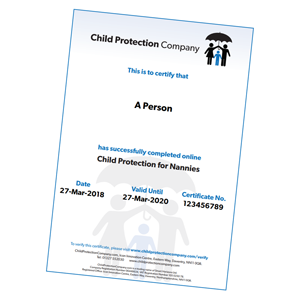 Our Child Protection for Nannies course has separate modules on anti-radicalisation and the Prevent duty, as well as online safety, which fulfils the safeguarding outcomes as specified by Ofsted. It is essentially three courses in one, saving you both time and money. Is this Level 2 training? The safeguarding levels no longer apply to childcarers, however this comprehensive course equates to the old Level 2 standards. This course is designed to meet the child protection training requirements for nannies and au pairs, which is laid out in the statutory guidance for the safeguarding and promotion of welfare for children. There are regional variants of the course, written to meet the specific needs of learners in Scotland and Wales. Every day in the United Kingdom, many thousands of children are placed in the care of Nannies, au pairs, babysitters and other Home Based Childcarers. It is no wonder that the agencies who protect our children see you as vital in the process of safeguarding. Sadly, child abuse and child sexual exploitation are an all too common occurrence. By the end of the module, you will have an increased awareness of the importance of the role Childcarers can play in the safeguarding of vulnerable children by spotting the early signs of abuse and neglect. This module will introduce you to the terminology of safeguarding, and will define key words and concepts that will inform the rest of the course. By the end of the module, you will have an increased awareness of the definitions of key terms such as ‘child’ and ‘safeguarding’. You will also be more familiar with the legislation and guidance that applies to your role. To effectively detect, reduce and hopefully prevent child abuse, we need to strictly define what it is and how it manifests itself. Understanding the categories of abuse will help you to recognise the tell-tale signs that it is taking place. The increased use of technology by young people and children brings many benefits and, unfortunately, a few dangers. This module looks at the role of safeguarding when it comes to online safety. The content will give you an overview of the potential for risk when children are online in relation to, amongst other areas, grooming, sexting and cyberbullying. The module will remind you of the legal position should you become aware of an incident, and will outline ways of empowering children to be safe and report issues when online. By the end of the module, you will have extended your knowledge of the risks associated with technology, the different aspects of online safeguarding, specific risks children may be exposed to, and effective online safety practice. All childcarers have a legal duty to prevent children from being drawn into extremism. You are expected to challenge extremist ideas and recognise when children are at risk. This module places the Prevent strategy into context and considers the ways in which radicalisation can affect a young person and the groups that may attempt to induct a young person into their ideology. By the end of the module, you will have a greater understanding of the signs of radicalisation in young people and what to do should you feel a child or young person is in danger from extremist ideology. The focus when working on safeguarding or dealing potential abuse must be the safety of the child or young person. Remaining child-centred is key to the process of identification and reporting, because sadly, children sometimes report several times before any action is taken. The learning you will complete in this module is contextualised in a realistic situation, so that you can see how a child focus can be achieved. By the end of this module, you will have a better understanding of what it means to be child-centred in your approach and the responsibilities of childcarers in relation to documenting decisions. This part of the course builds on the work we did in earlier modules. Children can disclose in a number of ways, so, while you should maintain confidentiality where appropriate, you also need to know when to report and to whom. It is vital that you respond quickly and appropriately when presented with a disclosure of abuse, and this module covers the right process to follow and what to do (and what not to do) in order to achieve the desired outcome. By the end of this module, you will have a better understanding of the correct procedures to follow in response to a potential abuse situation and will know what to do if you have concerns about the behaviour of an adult. This module will look at the process in place should a child potentially be considered ‘in need’ in some way. All agencies work together to protect children using local and national guidelines to define common practice. At the end of this module, you will have a better understanding of some of the statutory assessments and child protection procedures in place in your region of the UK. The importance of recording and the early sharing of information cannot be overstated. Cases of abuse and neglect could be resolved and help provided much faster if all agencies were to alert and report incidents as soon as possible. It is also important that you record any particular incidents or potential issues as soon as they come to light because, should a child protection case develop, your evidence and reports will be key to finding a speedy resolution to support the wellbeing of the child. By the end of this module, you will have a better understanding of best practice when recording and sharing important safeguarding information. Your experience and your training should now mean that you will be clear and confident in your role within the safeguarding process, and this will form the basis of your ability to interact with other agencies. In this module, you will look at the agencies who work towards child protection and some of the tools that they use to help safeguard our children. Collectively, the agencies in your area will work with the Local Safeguarding Children Board (LSCB)/Safeguarding Partners, or Child Protection Committee (CPC) to ensure policy is followed. By the end of this module, you will have a better understanding of how to work with agencies to safeguard children. The unique nature of the home based childcarers, which often involves working alone in a home environment, can put you at risk of allegations and complaints. This module provides guidance about best practice. You will now take all that you have learned and apply it to an assessment of your knowledge. The final assessment is your opportunity to show how much you have absorbed, and why it is so important to have child protection training. Once you have passed your assessment you will be able to download your certificate. Your pass rate will be 70% but don’t worry if you do not pass the first time, as you can take the test multiple times.